Saturday was a city-wide event organized by the Ella Baker Center. People of all ages and from all walks of life came out to help make Oakland a better place. 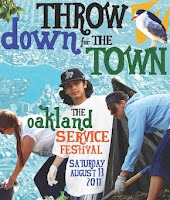 There were a variety of service projects all over Oakland, including cleaning up parks, wetlands restoration, working on community gardens, building homes with Habitat, creating a dog park, and working with seniors. I chose wetlands restoration, which was an event with Save the Bay at the Martin Luther King, Jr. Regional Shoreline. I selected it in part because I wanted to try something different, and it was an excuse to ride along more of the SF Bay Trail. When I got the confirmation email with directions, I found out it was also the 50th Anniversary for Save the Bay, and it was going to a shortened work day plus a celebration. I considered signing up for a different event, but in the end I'm glad I went to this one. While they had a full contingent of volunteers, it turned out I was the only one who was there as part of Throw Down for the Town. 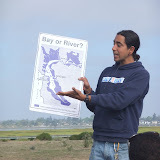 We started with a brief introduction to Save the Bay, how it was started, and the work they do now. On hand were dozens of volunteers, including a group from NBC Bay Area as part of their Bay Area Proud program. We then split up into different groups, to water new plantings, weed invasive species, pick up trash, and prepare for the celebration later. I joined the group weeding; one of the Save the Bay habitat specialists showed us what we were looking for, and off we went. Although the area has been under restoration for some time and is in general doing very well, there was a large amount of English plantain in one stretch, so we didn't have far to go to get to work. After a couple of hours of work, we wrapped up and got down to celebrating Save the Bay's 50th anniversary. There were games, a raffle, photos with the Save the Bay shark, various things for lunch, and mimosas or wine from Barefoot Wine & Bubbly. NBC Bay Area interviewed various people for sound bites, and we did a group shot with everyone shouting "happy 50th anniversary, Save the Bay!". When I went to head off to Mosswood Park for the Throw Down for the Town party, I discovered I had a flat tire. Fortunately I was able to get a ride (thanks, Dylan! ), and after a brief stop at Manifesto Bikes to fix the flat, headed over to the party at Mosswood Park. 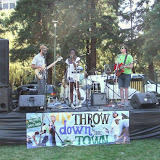 What did you do for Throw Down for the Town?